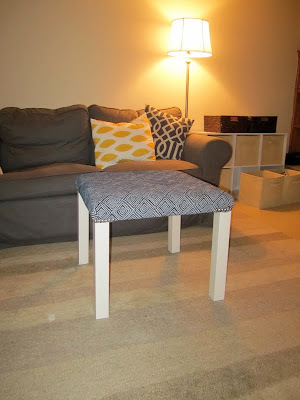 Swoon Style and Home: Ottoman-ia! 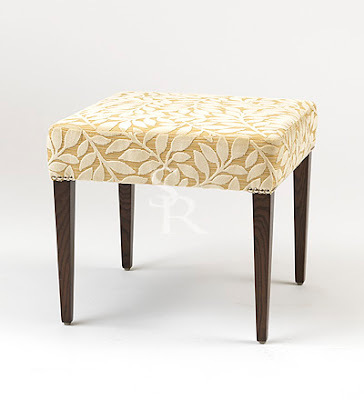 I've been on the hunt for the perfect ottoman for our den. It hasn't been easy because my requirements were nearly impossible: it had to fit the space (we have an IKEA Ektorp sectional -- and there isn't a ton of space for a large ottoman), it had to be soft and upholstered, it had to double as a coffee table, it had to coordinate color-wise with the room, it should have storage, it had to be durable (two kids) and it should be inexpensive. Ha! See why it was impossible? I found several things I liked but nothing that worked just right. You know what that means?!? Time to DIY. I decided to hack a Lack: the Lack side table from Ikea. I bought it in white for $8. I realized that the storage requirement would fall by the wayside. 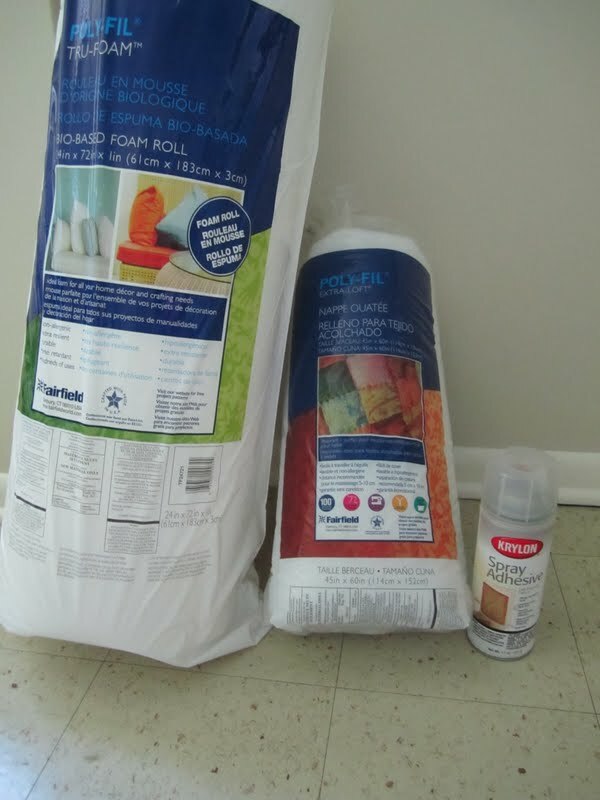 I bought some foam and batting at Wal-Mart and followed the same procedure as when I made my upholstered headboard last Summer. First, I cut the foam to size and used some spray adhesive to keep it in place. I sprayed both the foam and the table-top for extra durability. Then, I cut the fabric to size, using the top of the Lack as the template. Then, I cut the batting. Flip the table over and start stapling! There is Coco, happy to help as always. Anyone who has stapled fabric onto furniture knows it is a tedious process with a lot of folding, tugging, cutting, flipping, repeat. This was no exception. Finally, I had to screw on the legs. It was a little tricky because the hardware had to go through the fabric, but I took my time and made sure to tighten and adjust the fabric as I went along. Then I trimmed up the edges. I ended up adding a strip of white grosgrain ribbon around the edges of the fabric under the table ... just because I am insane like that. And here it is looking pretty darn good, if I may say so! Finally, I decided to add that nailhead detail that Sarah Richardson put on the inspiration stool. I had the nailhead trim leftover from my headboard project so I just grabbed that and tacked it down. I love the finished look! I love that I can put a white tray on top to hold drinks or magazines, and there is still plenty of room for feet to rest. This project took about an hour or so to complete. Not bad at all! And the cost was pretty good too. I ended up paying $53 total [$8 for the Lack table, $20 for batting & foam (lots left over for more projects), $25 for fabric]. However, the cost was more like $25 total, since I used only a quarter of the batting and foam and less than half of the fabric. What do you think? Are you inspired to DIY something fun? Share! I'll note that the den is still very much a work in progress. The rug, while I love it, has got to go. It's too small and way too white for the space. I need to hang curtains and repaint. And I cannot wait to paint the mantle and woodwork there. And possibly paint the fireplace. Oh, and hang pictures. Lots and lots to do! You are a busy bee!! It looks great, just like the inspiration photo! How about a big chunky square basket underneath for storage? Looking good! 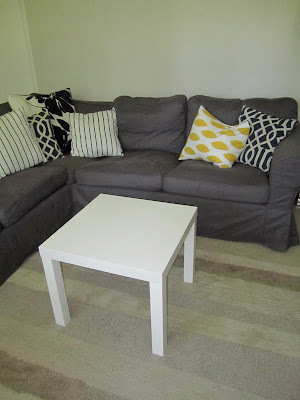 I've been thinking of upholstering a little white table I have that looks like the Lack. But I think I'm going to upholster the legs as well. Thanks for the inspiration! cuteness! what a great idea! Thanks everyone! I'm really happy with how it turned out and you can't beat the price. This is really cute and creative...I adore the fabric! I big fat love it! I may be stealing this idea in the future. I LOVE IT! It is unrecognizable from what it was-- and amazing. Well done! This is such a great idea, and I intend on doing something similar in my new apartment. I'm curious, how exactly did you screw the legs on? It obviously wasn't through the top, right? Did you toe-nail the screws through the side of the legs, or did you have some other method? Hi! I'm glad you like it! I did just screw through the bottom of the table. The LACK has holes pre-drilled, and I before I started to screw in each leg, I would look and see where the hole was and then push the screw on the leg through the fabric right into the base of the table. I hope this helps!